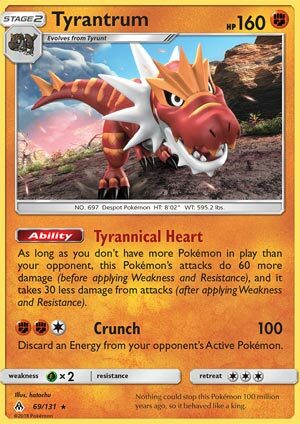 Tyrantrum (FLI 69) stomps back into the meta out of the Forbidden Light expansion set. This Stage 2 fossil Fighting type has 160 HP and both an ability and an attack. Its ability, Tyrannical Heart, increases its damage by sixty points and decreases damage done to it by thirty points … IF you have the same number or less Pokemon in play than your opponent. In four matches – all losses – I struggled so much to both get a Tyrantrum out AND powered up. Three attachments on a Stage 2 fossil is just not realistically possible in the state of the game today. This deck makes Garchomp look agile and dynamic. I struggled with Garchomp. To say that I struggled with this deck doesn’t even come close to describing the difficulty I encountered. I will say that I did not try the same structure that I had with Garchomp: I tried the Drampa GX, Hala, Cynthia engine that was so successful for Zygarde 72. I also included four Talonflame, and this way I would have eight potential opening Pokemon to minimize the number of mulligans I might incur. This might not have been the best strategy for Tyrantrum, but I couldn’t use four Alolan Vulpix like I did with Garchomp: Beacon doesn’t allow you to search out Unidentified Fossils. Maybe the Drampa / Cynthia / Hala structure isn’t right for Tyrantrum, but at this point, I don’t think anything is. Friends don’t let friends play Tyrantrum…. All kidding aside, maybe I’m wrong, maybe there is a strategy out there I’m just not seeing that will allow Tyrantrum to win at least some of its matches… I just have no idea what that strategy is. A Stage 2 that needs three manual attachments is going to be too slow to be competitive.